Finchingfield is on the B1052 Braintree to Saffron Walden road, fifty-four miles from London and close to Constable Country. In the time of William the Conqueror it was called Phincingfelda. 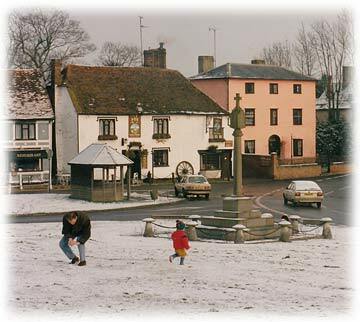 William gave Finchingfield to one Roger Bigod (his way of rewarding his knights for their services during the invasion). The arrangement of houses around a central green produces a harmonious effect. There may be villages with smarter greens, more stylish buildings, or prettier ponds but they rarely combine in quite such a natural, apparently unplanned way. The classic view of foreground green, pond, more green, cottages and road climbing a hill surmounted by the church must have inspired hundreds of thousands of photographers and a good many painters. It appears in virtually every calendar of Essex. The best approach to the church is through the archway of the Guildhall, which was built around 1500. 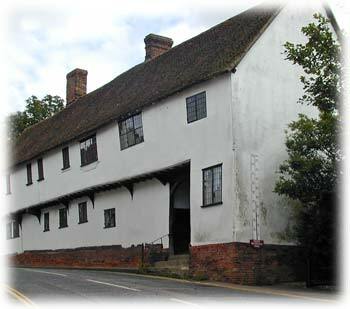 In 1630 it was deeded to trustees to be used for the benefit of the village as a schoolhouse or almshouse. The old school room has been used as an exhibition space and the alms houses next door were converted into flats for older villagers. The building has recently had a major renovation. Click here to visit the Guildhall web site. Down on the green there are many interesting buildings to see. The snow scene shows the Fox Inn and next to it the Manse, which was the home of the Minister of the Chapel. The War Memorial commemorates the 27 men of the Parish who died in the first world war and six who died in the second. Look for examples of pargetting. This is the technique of moulding designs into the external plastering of a wall. Incised pargetting is the most common, but the raised variety is also to be found, usually on larger houses. It is very characteristic of the area. 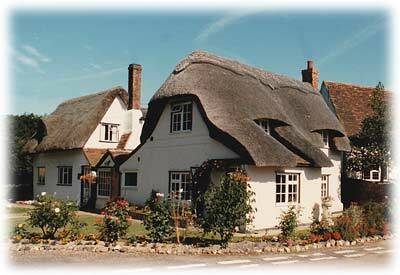 The tiled roofs on most of the buildings in the centre of the village contribute to the harmony of the scene. If you're looking for thatch, left, try the road that passes the windmill. Further down from the cottage shown here is the Round House, of 18th Century Dutch design and referred to locally as the Pepper Pot (see the buildings page). 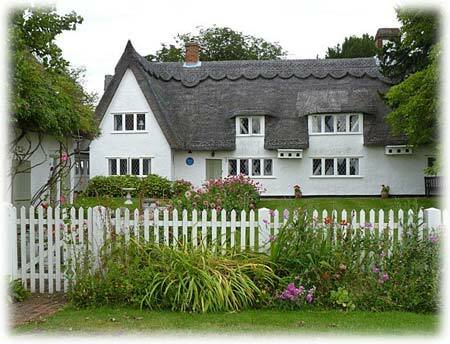 Some way out of the village on the same road is a house once owned by the writer Dodie Smith, author of "101 Dalmatians". There's a blue plaque to the left of the door. Photo taken in 2012 by Kathy Martin. The poet and patron of the arts Edward Benlowes was born in the village in 1602. Amongst the many painters who have been inspired by the village was Lucien Pissarro (20 February 1863 – 10 July 1944). 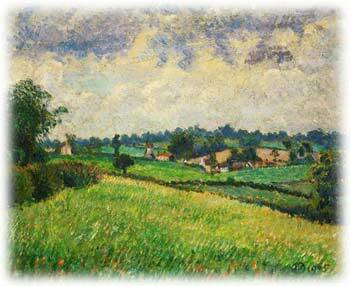 He was a son of the great French Impressionist Camille Pissarro and painted in the impressionist style. 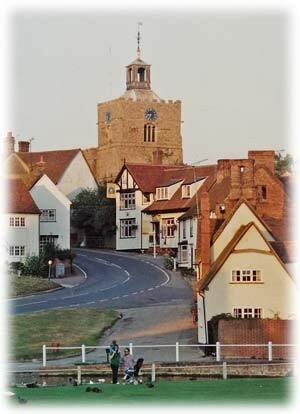 He moved permanently to England in 1890 and visited Finchingfield twice, staying at a local farm. His first trip, in 1904, was blighted by bad weather and he was only able to produce some sketches. The following year, however, he made several oil paintings. The most distinguished house in the area is Spains Hall, named after a Norman family called Hispani who owned a property here in the 11th century. 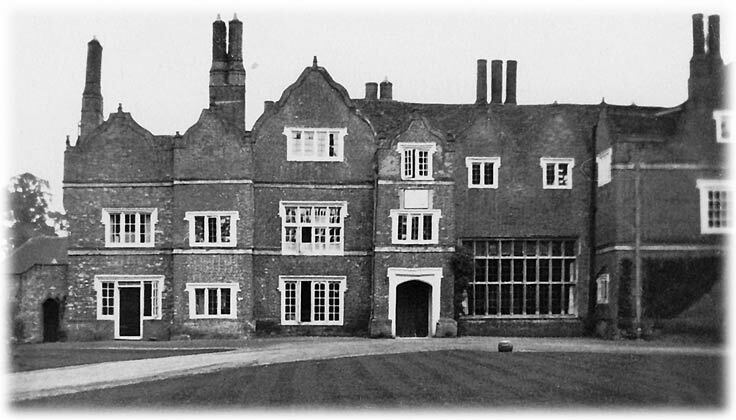 The present building, seen here in the 1930s, is Elizabethan. From the 14th to the early 18th century the property was owned by the Kempes. A strange tale is told about one of the Kempes. William, born in 1555, married Philippa Gunter in 1588. After thirty years of marriage William came to suspect her of being unfaithful and flew into one of his frequent rages. Realising his mistake William decided on a dramatic way of preventing further outbursts and vowed never to speak again. As he spoke his vow he was overheard by one person, known as 'The Raven.' This man was thought to possess supernatural powers being the seventh son of a seventh son. Three ravens had perched on a tree outside the window on the night he was born, hence his nickname. He urged Kempe not to keep his vow as it would bring disasters upon him. Sure enough, it did. In the first year of silence three of his servants were drowned, possibly in the first of seven ponds which William would have dug in the grounds of Spains Hall, one for each mute year. In the second year Philippa herself died. In the third he fell from his horse one evening, injuring his leg. Unable to call out for help he spent the rainy night lying on the ground before being found the following morning. Toward the end of year five Kempe had business in a nearby town. Returning home with his groom they were caught by a thunder storm and took shelter in an old ruin. Kempe could hear voices and it soon became clear that he was listening to a gang of burglars who were planning to break into Spains Hall. He set off with his groom, who hadn't heard the men talking, to get home in time to raise the alarm. Unfortunately the storm had flooded the river Blackwater, which they had to cross. He wrote a message and the groom set off across the river with it. By the time the faithful servant reached the house the water had washed out the message so all the able-bodied men of the house, unaware of the nature of the threat, set out to find and protect their master. Their absence made the task of the burglars easier. When Kempe and his men finally returned they found the house stripped of its valuables and the dead body of a young boy, a distant relative, killed by the crooks. In 1625 the vicar of Finchingfield passed away and the vacant living was in the gift of William. He appointed Stephen Marshall, the preacher at nearby Wethersfield, (click here to see his Wikipedia page) and it was he who finally persuaded Kempe to abandon his dreadful vow. Kempe died three years later, in June 1628.